Primary language learning. "PLN" at your service! Welcome to the World of Primary Languages Network.We are here to help your school and staff develop the confidence to deliver effective and creative primary languages.Here's what one of our primary schools thinks about the service and resources we offer at Primary Languages Network. We are a network of over 250 schools.Primary Languages Network has a dedicated team of primary languages teachers who work in 49 of these schools every week of the school academic year. We teach French ,Spanish and German and can offer support with other languages too. Our intention is to "keep the PRIMARY in language learning". Find out more here about our vision and the progress we have made since Janet Lloyd founded the service in 2011. From 2011 onwards we have been busy developing the effective service we offer now to support all our network schools.These schools range from beginners and non-specialist linguists to established and outstanding practice in primary languages' schools. Every school can access over 5,000 resources and benefit from the dynamic and bespoke support we can offer. As primary practitioners we understand the aims,challenges and requirements of the busy primary classroom and school. 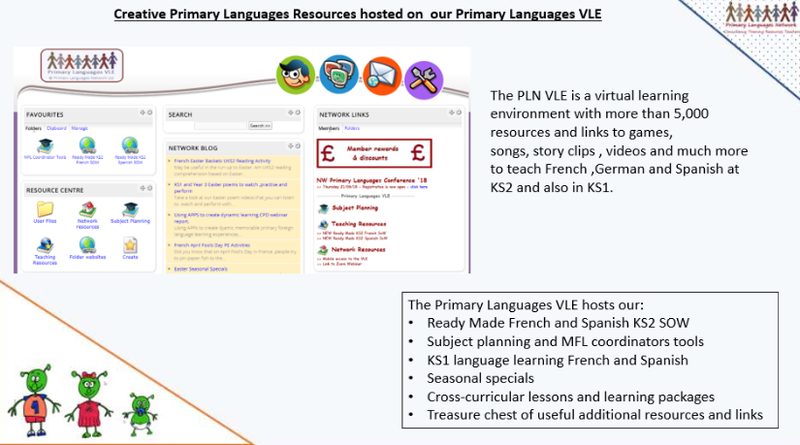 All Primary Languages Network members have access to the PLN virtual learning environment .A one stop shop for inspiration,sharing of work, ideas, seasonal special activities and materials and a comprehensive Scheme of Work. Together we have developed a SOW which offers primary schools effective, creative planning and total support with the teaching and learning of primary French and Spanish in KS2 from Year 3 (age 7) to Year 6 (age 11). 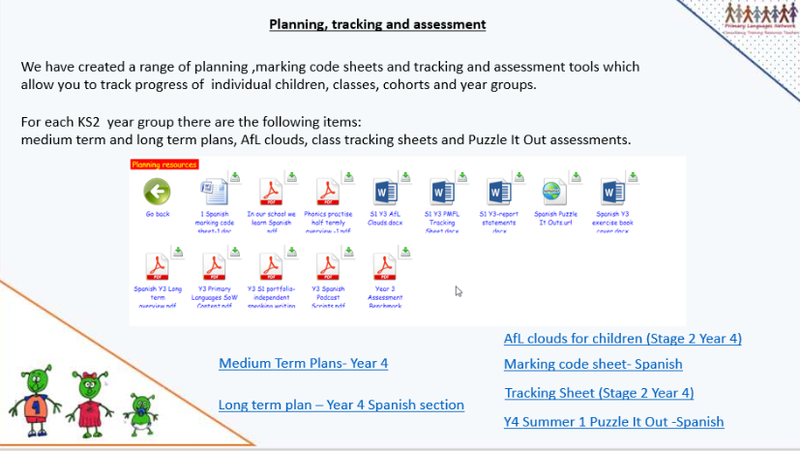 Save your successes and share and demonstrate your progress with the whole school, the wider community and store your outcomes safely in your unique User files on the VLE. The VLE has a mobile APP so you can very quickly take a photo of an activity in class and share and save in the User files. 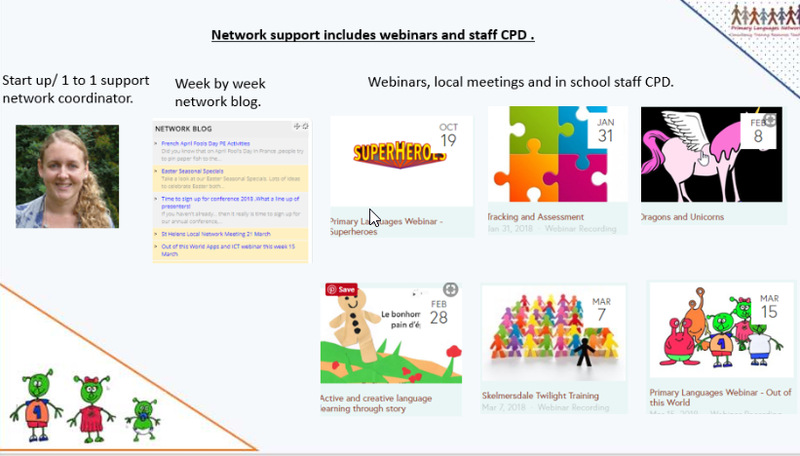 Our CPD webinars will help your school and staff bring language learning from the French and Spanish KS2 Ready Made SOW to life. Here are two examples of our webinars this year, devised and led by our PLN primary languages teacher team. In all our lesson plans we make sure that effective primary stage appropriate progress is built in across all four core skills-listening,speaking,reading , writing , across language learning skills, basic grammar (nouns,adjectives and basic verbs) and phonics/ phoneme-grapheme transfer. Our proven and refined tracking and assessment tools will help your school assess next steps and keep a record of progress and our network coordinator,Catherine, is on hand by email and pre-arranged webinar to help you with any issues or individual school challenges or requirements. Every year we hold our annual conference and premium members are entitled to a free place at the conference. In 2018 our conference is focusing upon "Making languages sparkle". At every event we make sure that the CPD is valuable and helps schools to reflect on practice , network and share own experiences and leave with next steps and support necessary to achieve these next steps. Here's a taste of our 2017 conference. You can follow us on our Primary Languages Network Facebook page or on Twitter account too. We look forward to you joining us and thriving as a member of Primary Languages Network.To find out details of our different membership options plus our monthly subscription options or to contact us for more information then just click here. Further details and membership options.